Fans of Disney’s latest collectibles craze, the Mickey Mouse shaped Vinylmation series, stay tuned. 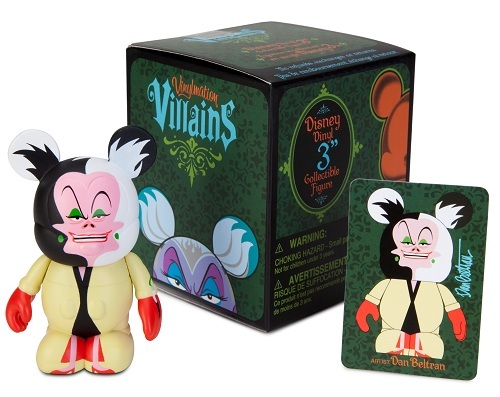 I have been sent a very special sneak peek at the Vinylmation Villains series created especially for The Disney Store and DisneyStore.com. The new series will be available beginning January 31, 2011. 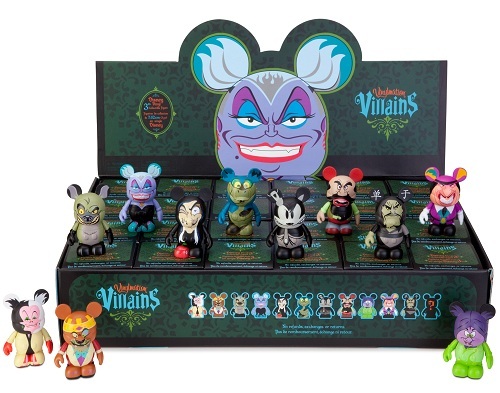 The eleven figures assembled in Villains Series #1 are: Ursula, Prince John, Banzai, Mim, Kaa, Cruella De Vil, Steam Boat Pete, Old Hag, Stromboli, Shan Yu, Ratcliff. Of course there’s also the elusive chaser. Suggested retails price for all the 3 inch figures is $9.95. With one of the nations biggest shopping days right around the corner, The Disney Store has been erroneously included in a rumor that is circulating the internet about stores that are closing locations. The Disney Blog has not been one of those sites. You may have seen the email which warns consumers not to buy gift cards this holiday season. Just to be clear the Disney Store is NOT closing 98 stores and gift cards will still be honored. Disney Store currently has locations in more than 220 malls across America. Like many other stores, they are gearing up for the day after Thanksgiving and stocking the shelves with toys and items for Disney fans across the nation. More than 100 locations are opening at midnight this year. To find out if a store near you is opening at midnight, please go to www.disneystore.com and click on the store locator or call 800-757-5933.